I’m all about trying to find things to do with my husband. I HATE just sitting around watching TV, I always feel like we’re old, boring couple! 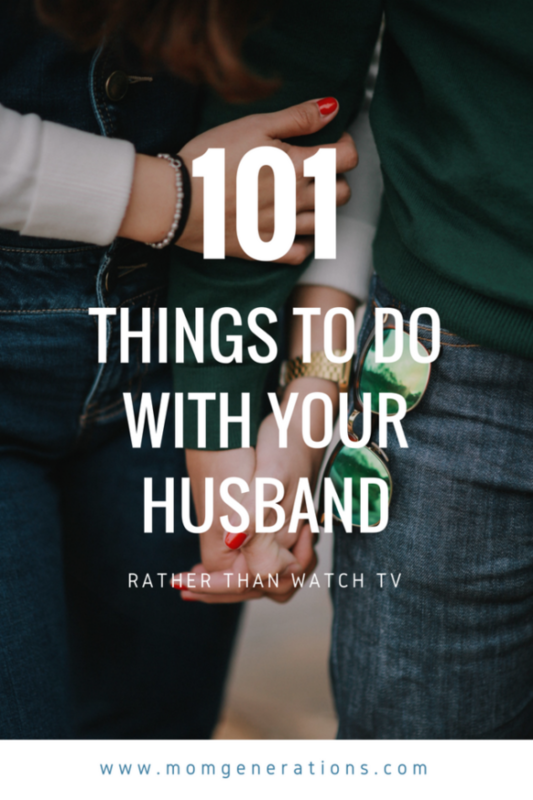 So I sat down and just drafted out 101 Things do to with your husband, rather than watch TV. That’s right. Let me say that again – everything BUT watch TV! OK… to EVERYTHING. But tons of things that you can do with your husband! I actually printed this list out and hung it up at home for us to refer to FREQUENTLY! Here we are – almost 15 years later – and most nights (OK, all of them!) we’re on the couch watching TV. 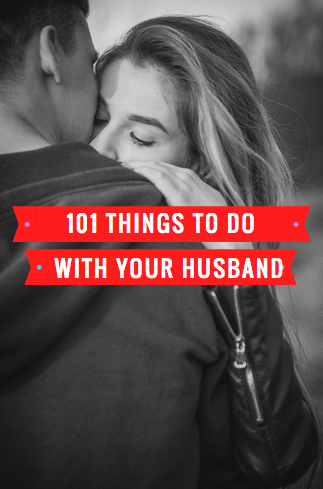 I’m sort of sick of it… I want to do some fun things together, so I have complied a list of 101 things to do with your husband. Not all of them apply to Matt and I, but as I got going… I couldn’t stop! 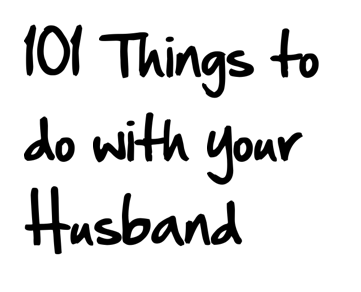 I had to much fun creating 101 Things to do with your Husband! So – without further adieu… here’s my list! Bike ride – around the block or out and about! Find a band you both like and see if they’re playing anytime soon or nearby. If not, head to a local bar who plays music. 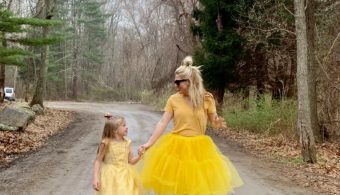 Roller blading – we used to do this all the time! When it’s raining, run outside and kiss in the rain! Find a place where you can do a dinner boat or a dinner train! If you have a hot tub, jump in! 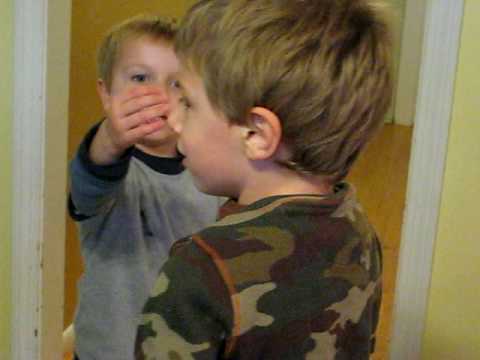 Create something for your kids and surprise them – blanket fort, pillow fortress, LEGO cave, etc! Hope you liked the all these things to do that I came up with – share what you’ve got, too! 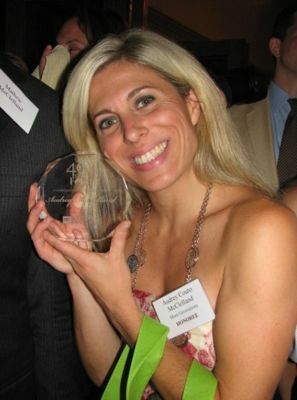 Also… check out some great date destinations with AAA !!! They have tons of discounts you can take advantage of, too! But really nice list! Gonna have to share this with my wife and highlight a few of ’em! Here are a few that I’ve done with my bf… thought I’d share too. … and I have to stop… lol… I can see why you had fun writing the list… I’m having fun remembering all the things we love to do together. Thanks for the list! You could volunteer at the animal shelter if you are not looking for a new pet. I am so happy to say that my BF and I though we do watch way too much tv… we manage to do most of the things on this list as well… looking forward to spending the rest of my life with this man. 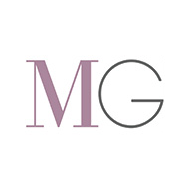 Thanks for the blog ! Thanks so much for this post. My husband and I were just discussing (ie: arguing) about the fact that we don’t have anything in common to do together. Our go-to activities are going out to eat or watching a movie (where he falls asleep). 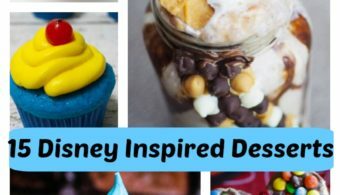 This list is full of ideas that we can actually do! I love the OCD comment! That is so me! Although I do have to say househunting is not a fun thing to do with your husband. We just went through it and we joked that we would either find the house of our dreams or get divorced 😉 Thankfully we found a house we love! A good alternative to not wanting to camp would be to find a camping place that has cabins. It is a little more expensive but totally worth it. The last time we went we had a lake near by so he could fish and there were some good hiking trails. Also we could walk down to a sand bar on the river and eat lunch. It was a great weekend. I love this list! Now, if only I could get my boyfriend to do more than going to the zoo or the flea market (both with kids). He refuses to do anything and it has simply gotten worse over the six years we’ve been together. Hi, Audrey! I came across your blog via Pinterest. My husband and I often just watch TV in the evenings after our son is in bed. It does get quite monotonous! I’m thankful for your ideas 🙂 By the way, we will also be celebrating our 11th wedding anniversary on June 30th 🙂 I met my hubby in mid-1998 and by September I knew I had met the one I wanted to be with forever 🙂 Small world! Keep up the great ideas and…happy anniversary! I’m sure you won’t be crocheting with your husband in the backyard. Haha. It’s NOT “without further adieu”! It’s “ado”. As in “Much Ado About Nothing”. Adieu means goodbye so wouldn’t make any sense at all.